If you’re like me, then buying a home might feel a little intimidating. But becoming familiar with the real estate world isn’t unlike learning the military lifestyle. How, you might ask? It’s the extensive lists of specialized terminology and the endless acronyms that go with them that make the two situations uniquely similar! You might not realize it if you’ve been in the military or a milspouse for years now, but there probably was a lot you didn’t know about military terminology that you had to learn like PCS, TDY, TLA, MEU, and BAH. In fact, the military loves acronyms so they’ve created way too many to list and more than I will ever know at one time. But the point is, you either picked up the ones you needed to know over time or you had a gracious friend teach them to you (bless them). 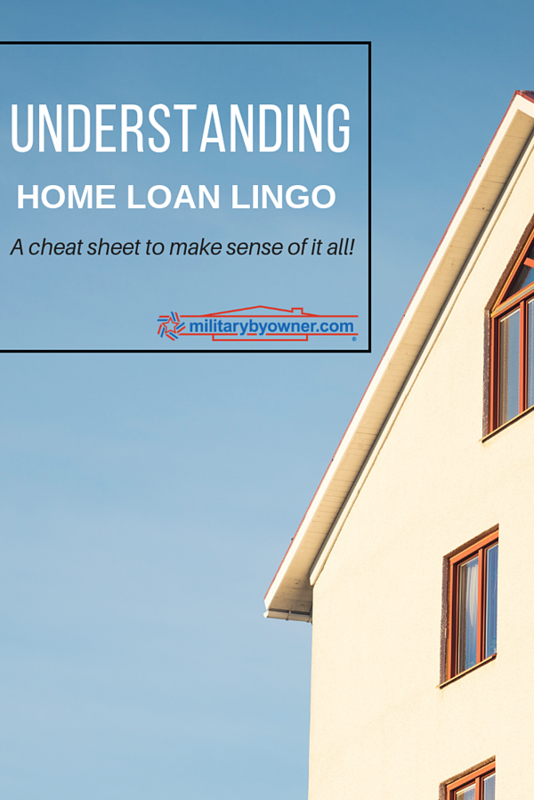 So, whether you’re new to real estate or you need a refresher, we've compiled a guide (with the help of Veterans United, Investopedia, and MortgageCalculator) to help you understand home loan terminology in no time! Homes are expensive, often more expensive than the cash we have saved. You might have enough money for a down payment, but not many of us have $100,000 dollars or more to pay for a home. So, we turn to the bank for a loan which becomes the mortgage. The following terms are listed to help you understand a mortgage and the way in which they work. Annual Percentage Rate: the rate of interest that will be paid back to the mortgage lender. The rate can either be a fixed rate or adjustable rate. Fixed Rate Mortgage: a mortgage where the interest rate is set for the duration of the loan. Many home buyers favor an FRM because it’s considered low risk. Since the interest rate remains constant from the time you take out the loan, you’re immune to market fluctuations. This can be great for home buyers looking to own a home for an extended number of years. However, should you want to assess a current market value after owning your home for several years, you’ll need to pay to refinance. This can open up your mortgage to fluctuate one way or the other depending on your home’s value in the housing market at the time of refinancing. Adjustable Rate Mortgage: An ARM is a type of mortgage in which the interest rate applied to the outstanding balance varies throughout the life of the loan. Normally, the initial interest rate is fixed for a period of time, after which it resets periodically, often every year or even monthly. The interest rate resets based on a benchmark or index plus an additional spread, called an ARM margin. ARMs assume a great deal of risk. The rates can rise, and if they do, you’re stuck paying a significantly larger mortgage each month. Additionally, if your ARM has a limit on how much you can pay on your loan each month, you risk a negative amortization--when payments don’t keep up with interest, which will cause homeowners to wind up in more debt. However, most banks will start an ARM at a lower interest rate since you are absorbing the market’s shifts. If you plan to only own the home for a few years before selling it (2 to 3 years at your duty station), you may not even feel a shift in the market--the chances of an astronomical increase in the market within the few years you plan to own the home are minimal. Plus, you don’t have to pay to refinance your home since the adjustable rate mortgage will fluctuate to reflect current market value. Adjustable Rate Mortgage Margin: a fixed percentage rate that is added to an indexed rate to determine the fully indexed interest rate of an adjustable rate mortgage (ARM). Adjustable rate mortgages are one of the most common variable-rate credit products offered in the primary lending market. Mortgage Insurance: an insurance policy that protects a mortgage lender or title holder in the event that the borrower defaults on payments, dies, or is otherwise unable to meet the contractual obligations of the mortgage. Private Mortgage Insurance: PMI is a special type of insurance policy, provided by private insurers, to protect a lender against loss if a borrower defaults. Most lenders require PMI when a home buyer makes a down payment of less than 20% of the home's purchase price – or, in mortgage-speak, the mortgage's loan-to-value (LTV) ratio is in excess of 80% (the higher the LTV ratio, the higher the risk profile of the mortgage). There’s more to home loans than the mortgage itself. You’ll often hear terms tossed around and be expected to know them. And if you don’t, you may find yourself falling behind in conversation and forced to learn them on the fly. It’s best to get familiar with it now and enter into a real estate transaction with a larger knowledge base. While these cover the large majority of common terms you’ll hear, there are more. But like with military lingo, I don’t think it’s necessary, nor reasonable, for any one person to have each and every term memorized. So, these are a list of the more frequently used terms that you’ll be expected to know. Down Payment: the amount of the purchase price that the buyer is paying. Generally, lenders require a specific down payment in order to qualify for the mortgage. Appraisal: an unbiased professional opinion of a home's value. Appraisals are almost always used in purchase and sale transactions and commonly used in refinance transactions. In a purchase and sale transaction, an appraisal is used to determine whether the home's contract price is appropriate given the home's condition, location, and features. Home Refinancing: the process of obtaining a new mortgage in an effort to reduce monthly payments, lower your interest rates, take cash out of your home for large purchases, or change mortgage companies. Many homeowners choose to refinance after owning their home for several years with the hope of lowering their mortgage rate or using some of the money for other larger purchases like buying a car or paying off credit card debt. Here’s how it works. The home is appraised, the lender decides how much they are willing to loan, and then the amount owed on the original mortgage is subtracted. The remaining amount after the original loan is paid off is loaned to the homeowner. This is a great opportunity to reduce the mortgage interest and use the money to invest back into the property by making updates, remodels, and modifications. Amortization: the schedule of how the loan is intended to be repaid. For example, a typical amortization schedule for a 15-year loan will include the amount borrowed, interest rate paid, and term. The result will be a monthly breakdown of how much interest you pay and how much is paid on the amount borrowed. Escrow: at the closing of the mortgage, the borrowers are generally required to set aside a percentage of the yearly taxes to be held by the lender. On a monthly basis, the lender will also collect additional money to be used to pay the taxes on the home. This escrow account is maintained by the lender who is responsible for sending the tax bills on a regular basis. Home Inspection: an examination of the condition of a real estate property. This usually takes place in connection with the property's sale. A qualified home inspector can assess the condition of a property's roof, foundation, heating and cooling systems, plumbing, electrical work, water, and sewage, along with some fire and safety issues. In addition, the home inspector will look for evidence of insect, water, or fire damage or any other issue that may affect the value of the property. Typical home inspections will run buyers about $300-$500 depending on several factors, such as the size of the house and the property’s location. It’s tempting to try and skimp on every dollar you can when purchasing a home, but forgoing a home inspection doesn’t make sense financially or emotionally. By spending a few hundred dollars up front, you’ll save yourself from paying costly repairs, possibly into thousands of dollars, down the road of homeownership. Some homebuyers simply don’t have the fortitude to stomach the unknowns of purchasing a house without a professional inspection. Lying awake at night in a cold sweat for months isn’t worth saving $400. Let’s talk about different types of loans. I won’t spend time here focusing on eligibility and the pros and cons of each loan. You can get a comprehensive look at each veteran and military-friendly loan in our post Home Financing Options for Military Veteran & Home Buyers. But I will provide a brief overview of loans you should be familiar with and eventually consider when it comes time to take out a loan. VA Loan: The VA Home Loan is known for its competitive interest rates and the no down payment option for veteran and military home buyers, and some family members. FHA Loan: The Federal Housing Association is part of HUD and helps qualifying home buyers get a great deal when it comes to buying a home—especially if you’re a first-time home buyer. USDA Loan: A USDA loan is a great option if you’re looking to buy a home or land in a rural area. The loan is designed to help home buyers in a lower financial bracket. Conventional Loan: Conventional home loans aren’t backed by the government, so they’ll likely require a higher down payment accompanied by private mortgage insurance. A conventional loan is a great option if you don’t meet the eligibility requirements for other loans and you have great credit. In addition to researching types of loans, stay up to date on rebates and incentives for military home buyers and sellers. For more information on the home buying process, visit our home buying resource page, free ebooks, and blog where we’ll walk you through the process as a whole. Here are a couple great resources to get you started. Ready to start the process of finding your new home to buy? Hop on our home page and search your duty station to find listings in your area. Be sure to keep this terminology cheat sheet in your back pocket where you can easily refer to it!